It is time again for the Monthly Organizing Round-Up at Organizing Junkie. For the month of June it was all about our CAR. We do a pretty good job keeping extra clutter from piling up in our car, but we are not very good at keeping the car clean or stocked. Our car needed some work. I started by taking the car to the mechanic. That pesky check-engine light was on again. Whenever it gets really hot something triggers it, but it is not readily obvious why and there are no other symptoms. I took it in to test it and in the middle of the test it went off. We will watch it for another few weeks before investing serious money to fix our phantom problem. Time to tackle the cleaning. I started by taking everything out of the car - car seats, mats, papers, toys, maps, etc. It was amazing how much stuff was hiding under the seats. Next I wiped everything down. There was about an inch of dust on the dashboard and the windows were desperately in need of cleaning. Then it was time to vacuum. There were cheerios and gold fish hiding everywhere. I ended up removing the seats entirely to clean under them. First I checked and restocked the emergency kit: jumper cables, tire patch kit, flares, first aid kit, a few tools, blanket, etc. Next was the glove box - only the registration info, a pad and pen, and the air pressure gauge made it back in. Two maps were refolded and returned to the door pocket. Lastly were the random supplies that we keep, "just in case:" plastic bags (kept a paper towel roll), small umbrella, a few toys (doodle pads, most importantly), baby wipes, sun block, hand sanitizer, a few clean rags. I also normally keep extra clothes, diapers, etc. in a small bag for emergencies, but I decided to keep a ready-packed bag in the entry closet instead. I can grab it quickly, but it doesn't have to take up precious car space all the time. Our kids are old enough that we haven't used this bag in a long time, but we'll see if I end up regretting this decision. So, how is your car looking these days? Thanks to Laura at I'm an Organizing Junkie for inspiring me to tackle this much-needed project. A Closer Walk with Him! "My dear child, don't shrug off God's discipline ... God is educating you; that's why you must never drop out. He's treating you as dear children. This trouble you're in isn't punishment; it's training, the normal experience of children.... At the time, discipline isn't much fun. It always feels like it's going against the grain. Later, of course, it pays off handsomely, for it's the well-trained who find themselves mature in their relationship with God." I just loved this paraphrase of Hebrews 12. Discipline is really education, not punishment. Isn't that exactly how I treat my children? I am training them how to live with self control and wisdom. 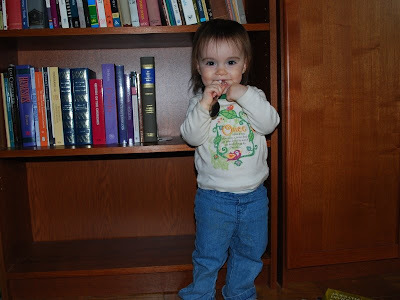 But the most beautiful part, discipline can lead to maturity, and especially maturity in our relationship with God. Isn't that the true desire of my heart? To walk more closely with my God? I want to be stretched, corrected, taught. Although it is hard to receive it at time, I need your discipline in my life. Teach me, correct me, train me, discipline me - that I may grow up to be mature and fruitful in my relationship with you. I pray that I will learn from my mistakes to avoid going through them again. Thank you that you love me enough to discipline me and that you desire me to grow into something better than I am right now. Today we took a trip to Toys R Us. We had a gift card that was about to expire, so we went to find a new train for Joshua. We played with the balls and the stuffed animals. We checked out all the Wiggles stuff. Then we encountered all the bikes and cars. 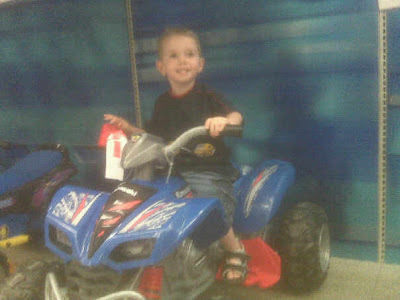 Joshua enjoyed the cars and vehicles. But they was Abigail's favorite part of our entire trip. 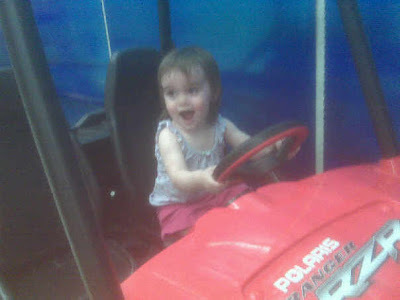 Every few minutes she would take off toward this aisle yelling, "Car, car!" 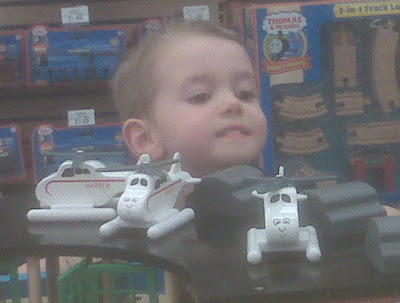 Joshua soon forgot the cars when he discovered the Thomas train table, complete with several display trains and Harold the helicopter. He must have played at this table for over 30 minutes -- Darren played with him while I followed Abigail back and forth to the cars. Every time we would mention leaving, he would tell us that he was not done working. What a funny choice in words! I think he was referencing the books we read where Thomas had to work pulling the cars. At the end of our play time, Joshua picked out a green Percy train engine to come home with us. 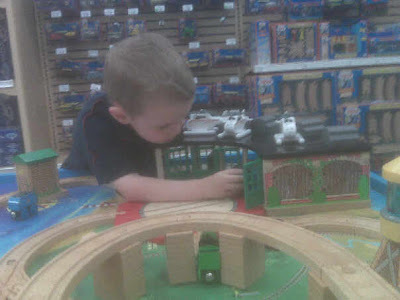 Joshua repeatedly told us how excited Thomas and Gordon (the two trains he already owns) would be to play with Percy. And Abigail promptly fell asleep. 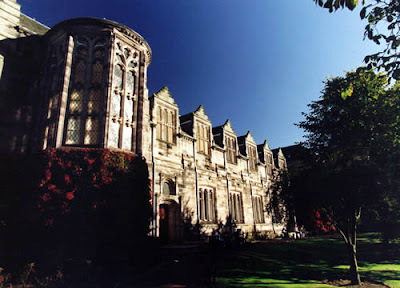 Yesterday, Darren sent in his acceptance to the University of Aberdeen for their PhD degree in Divinity,a three to four year program. And the countdown to Scotland officially begins! Most of the details are still up in the air, but here is what we know so far. The PhD programs begins on October 1, 2009. We will remain in Princeton until the end of July. After putting our stuff in storage, we will be staying with family in the Northwest until mid-September. The school does not have family accommodations, so we will need to locate off-campus housing. 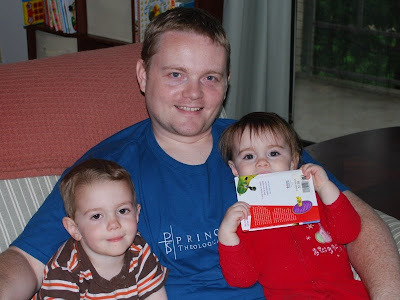 Darren may be going over in August for a week or two, if we cannot successfully locate a place to live via networking. We are very excited about the adventures that God has planned for us in the next few years. For now, there are a million details that need to be done before we leave. I had a great week working on this project. But sorry, no pictures this week. Here were my goals and what I was able to get done. This week I was able to spend three one-hour blitzing sessions. I spent two hours sorting letters, notes, souvenirs, etc. I decided to tackle all the letters and cards that have been waiting in my file cabinet at the same time. I was able to reduce everything down to one box of letters and one box of souvenirs. Last week I was bemoaning the fact that it would cost over $650 at Sam's Club (the cheapest option) to convert our 85 rolls of film. I was talking with my hubby about how much we could actually budget to spend on this. In the middle of our conversation, he paused, grabbed his computer, looked something up online, then smiled at me. The school has a negative scanner that I can use for FREE. WooHoo! I spent one hour at the library this week, to learn how to use the scanner and to start actually scanning. Now I have a pretty good idea how long it would take to scan everything. TOO LONG! I do not have 80+ hours to scan every roll of film. I will need to prioritize the rolls to scan and just leave the rest for another time. I started sorting pictures that need to be scanned, but haven't gotten very far. First I need to determine which pictures that don't have negatives, but that are important enough to spend the time scanning. I will need to work on this more next week. I was only planning on spending another 11 days on this project. That should be enough time to finish sorting all the remaining stuff on the top of the closet. However, that will probably not be enough time to complete all the scanning I was hoping to get done. Once I am done sorting, I will have a better idea how much time I need for scanning. Finalize the project plan and time line. I am getting more aggressive with my goals for this week. I cannot afford to spend all summer on this project. There are too many other areas that need my attention. This was the first full week of my big summer project - the top shelf in our bedroom closet, full of pictures, photo albums, etc. One hour sorting / purging. Although I technically met my goals for the week, but I am beginning to realize that this project is going to take more time than I originally expected. I started my hour long blitz by pulling out all the memory boxes that were stacked on the shelf. This will be the first part of the closet shelf I will tackle. When I opened them, I was pleased to find that the boxes were fairly well organized. The first three were full of letters from friends and family. I am so sentimental about cards and letters that people have given me. In addition to these boxes, almost a quarter of our file cabinet is filled with correspondence that needs to be cleared out. Although I need to tackle this, it is not a good place to start -- I would be overwhelmed by my project before I accomplished anything. The next two boxes are filled with unsorted memorabilia and souvenirs -- more stuff to sort. Eeek! These boxes will also have to wait until later in my project. The last three I opened were full of pictures and negatives. I was surprised at much film we have here. These are what I am hoping to preserve digitally on film. There are about 85 rolls worth negatives from the last 20 years. I was originally planning on having everything transferred to CD, however, because the film is already developed, that option may prove to be too expensive. My hour was spent going through the pictures and negatives, putting them in order and becoming familiar with what we have. I also started the research on converting these negatives to digital files. The best option I have found is Sam's Club. They charge $0.21 per picture -- I would have to sort through every single roll and choose every each picture that I wanted transferred. Now that sounds like a lot of work. 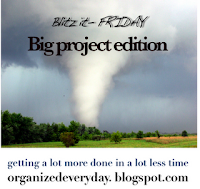 Spend at least one hour blitzing this project. Begin converting negatives to CD. Sort pictures that need to be scanned. Create a better plan and timeline for this project, so it is completed before our move. Has anyone else transferred their negative to CD? Do you have any recommendations? I could really use a better option. All the little people (and a few animals) were waiting in line at the bus stop for a ride. Joshua was driving a bus full of people around the table telling them about all the fun they would have when they arrived at school! It is wonderful to see how much Joshua has grown over the last year! What a fun little boy! Abigail has learned the art of answering yes/no questions this week. It makes me laugh every time she does it. I ask her a simple question like, "Would you like some milk?" Last week, her response would have been, "Milk, milk!" But this week her reply is an enthusiastic "Yeah!" She says it clear as can be and it always catches me by surprise. Darren asked me yesterday when our little girl went from being our baby to being a little toddler, wandering around, talking all the time. Sigh... it happened some time between February and May!